Apple could blur the lines between locally saved media files and additional content streamed from the cloud, listing all files as if they are part of the same media library on a device like an iPhone or a Mac. 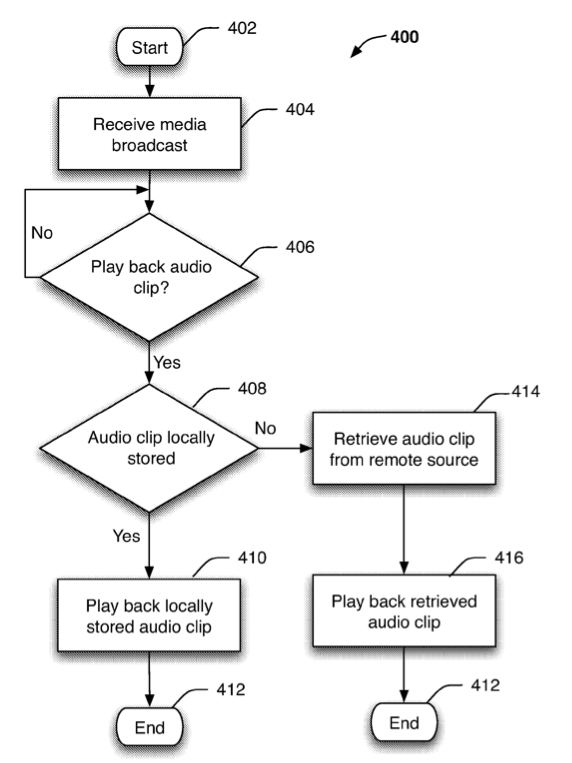 The U.S. Patent and Trademark Office this week revealed a new patent application from Apple entitled "Audio Clips for Announcing Remotely Accessed Media Items." Discovered by AppleInsider, it details a system that would include a centralized list of media files —some saved locally, and others available remotely. The application suggests that Apple's long-rumored cloud-based iTunes music streaming service could allow users to seamlessly merge their locally saved media files with additional content available for streaming via the Internet. Rather than having a separate list of cloud-based content, all of the media would be listed in one location, and the Internet-connected device would play back the selected content from the appropriate location. The application focuses largely on the audio "announcing" of selected content, as with the VoiceOver feature for the iPod shuffle. It suggests that such announcements would be accessed from prerecorded files that would be stored locally on the device, while unavailable announcements would be streamed remotely. "The device can include an audio clip of an artist name, song title, and album name, for example generated using a text to speech engine, or pre-recorded by an actor," the application reads. "The electronic device, however, may only locally store audio clips for media items that the device knows will be played back, for example locally stored media items." However, a more practical use for Apple's described invention would, of course, be for the streaming actual media itself, rather than VoiceOver clips, which are typically instantly generated. To this end, the patent filing details the ability of a user to "play back media items that are not locally stored" by streaming them from a "remote server." The application describes media being identified by locally stored metadata, detailing the artist, song title or album title of a particular track, or other information for different types of media. By reviewing this metadata, a connected device like an iPhone could then begin streaming the appropriate content from the cloud, if the file is not locally stored on the device. Apple's filing notes that streamed media could be made available through the iTunes Music Store, or via an alternate source. Apple has reportedly been interested in offering a cloud-based iTunes service for some time, but has had difficulties in securing the appropriate licensing deals with content providers. To bolster its cloud music efforts, Apple acquired streaming music service Lala in late 2009, but nothing has come of that investment yet. Lala allowed users to upload their music collection to remote servers and stream it back on any computer via a Web browser. Some have speculated that type of service would be an appropriate use for Apple's $1 billion server farm in North Carolina.